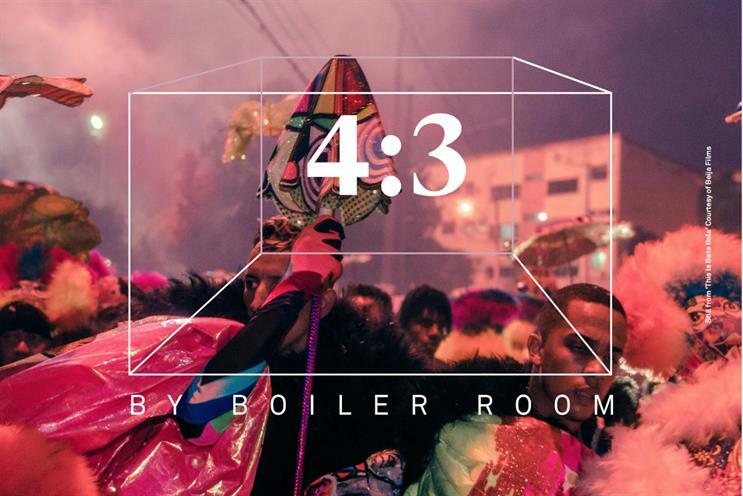 Music broadcasting platform Boiler Room has announced the launch of 4.3, a streaming platform with curated content supported by multi-faceted events that combine screenings, live music, installations and DJ sets. 4.3 will debut on 29 May and will give Boiler Room the chance to explore topics outside of music such as fashion, film, art and politics, with brands being given the opportunity to create documentaries. Ahead of its launch, Campaign caught up with Stephen Mai, chief content officer at Boiler Room and the former LADBible group marketing and creative director, and Amar Ediriwira, 4:3 creative director, to find out more about the new proposition. Since its inception, Boiler Room has been engaged with storytelling and narrating the "real", as a platform hosting and programming IRL (in real life) events and disrupting geographical advantage by broadcasting to the world. Ediriwira says that music has served "as our lens for exploring intersections of culture – like activism, fashion, and art". Previous activations have included Budweiser and Boiler Room taking their music workshops and performance series to Chile and scotch whisky brand Ballantine's staging a tour in collaboration with Boiler Room, featuring live acts performing across three continents. "4:3 plays off this idea, leveraging our central position within culture to create a platform and an archive for lesser-seen and under-represented ideas, events and content," says Ediriwira. "4:3 is Boiler Room extending its voice to tell untold stories that speak to our existing audiences as well as new ones." The 4.3 platform is looking to leverage the existing Boiler Room audience of over five million within its social community, tapping into the 157 million people it reaches every month. "The 4:3 audience is an extension of Boiler Room," says Mai. "They are young, culturally connected and curious about music, fashion, arts, travel and culture. This is a platform that will reach influential Gen Z and Gen Y people but our storytelling-driven content and events will be able to take our content to a much wider audience. Making the proposition platform agnostic allows us to tap into other channels to showcase 4:3 created and curated work." Mai adds that Boiler Room is currently in talks with traditional streaming platforms and linear broadcast channels to take 4:3 curated and commission works to mainstream audiences. With 4:3 rooted in physical experience; events will be multi-faceted – as Ediriwira describes, it will "connect the dots between club culture and cinema to stretch the boundaries of what a film experience can be". 4.3’s debut live event, an exhibition taking place from 30 May until 3 June, and timed to coincide with the platform’s launch on 29 May, will feature a multimedia tribute to cult musician Arthur Russell at St John on Bethnal Green, a church in East London. "A Portrait of Arthur Russell" exhibition is staged in collaboration with New York Public Library, with the show mixing film, sound art, photography and live music. It will feature a screening of the documentary Wild Combination, which will then go live on 4:3 on 3 June. Future events will include a party at Sheffield Documentary Festival in support of Hood By Air co-founder Leilah Weinraub's new Shakedown film. Towards the end of the year, 4.3 will be working with Elijah Wood on a tribute to Prince, which will include film screenings, DJs sets, live music and installation work. "Like our online presence, our immersive events are driven by seasons, editorial insight and curation," says Ediriwira. "Brands will be able to work with us to co-curate and sponsor our screenings, parties and exhibitions, as well as content across all our digital touchpoints." According to Mai, brands will be able to create documentaries or work with an artist to create an installation or curate series of short films, giving them a chance to build authenticity around their brand, enabling it to communicate their purpose, commitment to the arts or to celebrate the culture they are engaging with. "We’re allowing brands to create seasons with us that authentically allow them to tell their brand or campaign story through film, editorial, events and the people they work with to an audience that is passionate about beautiful storytelling" adds Mai. "We will give consideration around the brands we work with to ensure that the platform isn’t oversaturated with branded seasons. This means that the brands that do work with us get real visibility with our audience and make real impact." Media360: how can the industry 'reimagine advertising'?